Condition is Used. R ac k mo un ta bl e. 4 x 14 6g b sa s.
Removed from a working 2950 server that has now been de commissioned. May fit others. Priced to Clear. DELL PowerEdge 2950 PE2950-FW-E01 Server. 2 x XEON Processors, 32Gb RAM, ESXi. 2 x 3Ghz XEON Processors. Windows Server 2012 Software. Collection in person only. Condition is Used. R ac k mo un ta bl e wi th r ai ls. 6 x 1t b Sat a. Removed from a working 2950 server that has now been de commissioned. May fit others. Dell PowerEdge 2950 Dual Core Xeon X3323 2.0Ghz. Dell PowerEdge 2950 Core Duo 2.0Ghz X5130. No Hard drives includeed. It all works fine and has Ubuntu 16 installed on it. I have done a fresh install so the disks are wiped. You may need to install an OS of your choosing on to it. This a is a good starter server for people learning. Dell PowerEdge 2950 III 2 x QUAD Core XEON 3.0GHz Rack Mount server. PCI-E Riser. DVD-Rom Drive. 2 x Power Supplies. Perc 5i Integrated RAID card. Dell PowerEdge 2950 2U 6 x 3.5" 6 x 3.5" 2x E5430 2.66 QC 16GB None Perc 5i DVDROM None 2 x 750W None None. Dell PowerEdge 2950 2U 6 x 3.5" 6 x 3.5" 2x E5354 2.33 QC 16GB None Perc 5i DVDROM None 2 x 750W None No Raid Card Battery. We will try to respond to all inquiries within 2 hours. We are happy to provide photos of actual units. The price is £30. The service is currently available only for The City of London & Canary Wharf. 2 x 36GB SAS 3.5" 15K Hot-Plug Hard Drives. 4 x 300GB SAS 3.5" 10K Hot-Plug Hard Drives. 8GB DDR2 Ram. Rack Rail Kit & Front Bezel. 6 x 3.5" Hard Drive Bays. CD-ROM Drive. (2x QUAD-CORE E5450 XEON 3.0Ghz processors. 3) I had a 2nd RAID card with internal mini-SAS connections installed on this server, with a batch of HDDs in separate cages. I therefore needed to get 3 mini-SAS cables out of the rear of the case without cramping. 3 x 750GB 3.5" SATAu 7.2K Hard Drive. Dell Poweredge 2950 Server. 1 xDell Poweredge 2950 Server. Processor - 2 x Dual Core Xeon 5130 2.00GHz Processor SL9RX. 2 x 1TB 3.5" SATAu 7.2K Hard Drive. CS 204203 -server 204204 -rails. Dicover greater veratility Read More >. Product Model: R230. Rack Height: 1U. Product Family: PowerEdge. Proceor Type: Xeon. Product Line: PowerEdge. Proceor Model: E3-1220 v6. Form Factor: Rack. Dell PowerEdge 2950 II 2 x Dual Core Rack Mount server. 2 x Dual Core XEON 2.0Ghz Processors. PCI-E Riser. 2 x 73Gb SAS Hot plug drives. 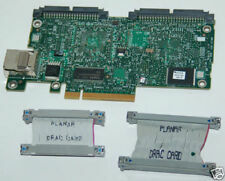 Perc 5/I Integrated RAID card. Rack Rail Kit & Front Bezel. Dual Gigabit ethernet. 6 x 400GB SAS 3.5" 10K Hot-Plug Hard Drives. 16GB DDR2 Ram. Rack Rail Kit & Front Bezel. 6 x 3.5" Hard Drive Bays. CD-ROM Drive. Processor -2 x Xeon L5430 Quad 2.66Ghz. Storage - 6 x 3.5" SAS Bays With 1 x 3.5" 450GB, 15K Hard Drives. Dell Poweredge 2950 III Rackmount Server. Optical Drive - DVD Drive. Rails - Included. Bezel -Included. Dell Poweredge 2950 II - 2x 2.33Ghz Dual core (Total 4 Cores). 8x Dell 146GB 3.5" Hot Pluggable SAS drive for£374.95. Internal Drive: 2x 73GB SAS 15K 3.5" Dell HOT PLUG drive cage ( 4 Blanks drive cage fitted ). Dell PowerEdge 2950 2 x Dual Core Rack Mount Server. PCI-E Riser. Rack Rails. Perc 5i Integrated RAID card. 2 x 750w Power supplies. Front Bezel. Dell Poweredge 2950 III - 2x 2.50Ghz Quad core (Total 8 Cores). DellPoweredge 2950 III -2U Server- 2x 3.0Ghz Quad core (Total 8 Cores). 4GB kit (2x 2GB) PC2-3200R ECC REG 240pin 400Mhz. Internal Drive: 2x 73GB SAS 15K 3.5" HP HOT PLUG drive cage ( 4 Blanks drive cage fitted ). Dell PowerEdge 2950 2970 2U Rackmount Kit Rapid Rack Rails. Condition is Seller refurbished. Dispatched with eBay delivery – Shutl 2-3 days. Dell PowerEdge 2950 III 2 x QUAD Core Rack Mount server. 3 x 146Gb SAS Hot plug drives. Perc 5/I Integrated RAID card. Rack Rail Kit & Front Bezel. PCI-E Riser. Dell Poweredge 2950 II - 2x 2.33Ghz Quad core (Total 8 Cores). Installed and Tested with VMware ESXi 4.1 & Microsoft Windows 2008 R2 Trial Version. combined with factory-integrated virtualization capabilities. Processor -2 x Xeon Quad E5430 2.66GHz Processors. Storage -6 x 3.5" 450GB, 15K SAS Hard Drives. Dell Poweredge 2950 III Rackmount Server. Optical Drive - DVD Drive. Rails - Included. Bezel -Included. Dell PowerEdge 2950 2 x QUAD Core Rack Mount server. PCI-E Riser. Rack Rail Kit & Front Bezel. 2 x 250Gb SATA 7.2k Hot plug drives. DVD-Rom Drive. Comprising this full Specification. Perc 5/I Integrated RAID card. Dell PowerEdge 2950 III 2 x Quad Core Rack Mount server. PCI-E Riser. 4 x 146Gb SAS Hot plug drives. Rack Rail Kit & Front Bezel. DVD-CD/RW Drive. DVD-Rom Drive. Perc 6/I Integrated RAID card. Removed from working Dell server 6x Seagate Savvio 10k.2 - 73gb 2x Dell Savvio - 73gb Questions, please ask? Dell PowerEdge 2950 2U Rack Mount server. PCI-E Riser. Rack Rail Kit & Front Bezel. DVD-Rom Drive. Dell Poweredge 2950 III - 2x 3.16Ghz Quad core (Total 8 Cores) X5460. DellPoweredge 2950 III -2U Server- 2x 3.16Ghz Quad core (Total 8 Cores) 12MB cache (2 x Xeon X5460). Form Factor: Rack 2U. 4GB kit (2x 2GB) PC2-3200R ECC REG 240pin 400Mhz. Dell PowerEdge 2950 II 2u Rack Mount Server. 3 x 146Gb SAS hot plug hard drives. PCI-E Riser Card. Rack Mount Rail Kit. DELL POWEREDGE 2950 SERVER. 73GB HDD x 4. 36GB HDD x 2. Dell PowerEdge 2950 II 2 x Dual Core Rack Mount server. PCI-E Riser. Rack Rail Kit & Front Bezel. Dual Gigabit ethernet. DVD-CD/RW Drive. DVD-Rom Drive. Processor -1x Xeon Quad E5405 2.00GHz. Dell Poweredge 2950 III Rackmount Server. CS 145767 -server 145768 - rails. Optical Drive - DVD Drive. Key - Included. Rails - Included. Bezel - Included. This server is fitted with a 1TB SAS hard drive. Hard Drives Installed: 1 x 1TB SAS 2.5". Processors: Quad Core Xeon 2.0GHz. Hard Drive Type: 2.5" SAS. How long does it take?. This informs us that you have received your goods and are happy with them. 2 x 73Gb 10k SAS Hot plug drives. Dell PowerEdge 2950 2 x Dual Core Rack Mount Server. Dual Gigabit ethernet. 2 x 750w Power supplies. Front Bezel. PCI-E Riser. For Dell PowerEdge 1950 1855 1955 2900 2950 M600 R900 SC1430 6800 6850 6900 6950. 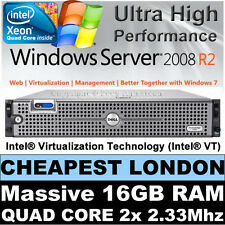 Manufacturer may vary - all supplied by Dell in Dell servers from new. PULLS FROM NEW DELL SERVERS. 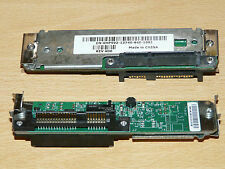 Dell part number for each dimm is SNPP9F035C/4G. For Dell PowerEdge 1950 1855 1955 2900 2950 M600 R900 SC1430 6800 6850 6900 6950. Data Integrity Check ECC Chipkill. Storage Capacity 32 GB : 4 x 8 GB. Upgrade Type System specific. Pulls from new servers - tested. TOE (TCPIP Offload Engine). Internal Drive: 2x 73GB SAS 15K 3.5" HP HOT PLUG drive cage ( 4 Blanks drive cage fitted ). Optical Drives: YES, DVD-ROM Drive. Internal Drive: 2x 73GB SAS 15K 3.5" Dell HOT PLUG drive cage ( 4 Blanks drive cage fitted ). TOE (TCPIP Offload Engine). Optical Drives: YES, DVD-ROM Drive. Tech Data Product Data Sheet - Dell PowerEdge R230(D73PX). Dell PowerEdge R230 - rack-mountable - Xeon E3-1220V6 3 GHz - 8 GB - 1 TB. Powerful,efficient,versatile. Consolidate data and drive applications faster with the powerful,efficient and versatile PowerEdge R230 entry rack server. Model Number: Poweredge 2950. 2U Rack Server. Storage - 8 x 2.5" SAS Bays NO HARD DRIVES INCLUDED. Dell PowerEdge 2950 III 2U Rack Mount server. 2 x 73GB 15K SAS Hot Plug Drives. 16GB Ram (4x 4GB). Dell PowerEdge 2950 III 2 x QUAD Core XEON 2.5Ghz Rack Mount server. PCI-E Riser. DVD-Rom Drive. 2 x Power Supplies. Perc 5i Integrated RAID card.